The famous original from World War II was Loose Lips Might Sink Ships. 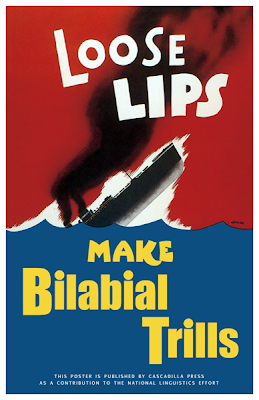 We have an updated version for our linguistics audience: Loose Lips Make Bilabial Trills. The text at the bottom says “This poster is published by Cascadilla Press as a contribution to the National Linguistics Effort.” We have more retro linguistics posters in the pipeline, so keep your eye on this space (or your department hallway). This poster was first available at our BUCLD 36 book exhibit. We’ve now added it to our shop on Cafepress, joining our other fun linguistics posters. This volume contains 26 papers selected from among those presented at the 14th Hispanic Linguistics Symposium, which took place from October 14-17, 2010 at Indiana University. The theme of the conference was "Variation and Linguistic Theory." The papers are grouped into sections on sociolinguistics, second language acquisition, morpho-syntax, and phonetics and phonology, and include Robert Bayley's plenary presentation. The entire proceedings is now available on our web site, and the printed edition will be shipping in April.